As posted by the Lethbridge Herald, October 29, 2014. Grade 2 and 3 students at Westminster Elementary School are already learning about the importance of helping others. As part of a project launched by the new non-profit organization Kids’ Art for a Cause, the children have created a series of paintings with starry skies symbolizing that everyone sleeps under the same sky and everyone deserves a good sleep. They have then been selling the works online to raise money for the charity Sleeping Children Around the World, which provides bedkits to children in developing countries. “It’s curriculum driven; in social studies, we’re learning about quality of life and so I wanted to choose something tangible that kids understand,” said Grant Bertamini, a Grade 2/3 teacher at Westminster Elementary School and the founder and president of Kids’ Art for a Cause. 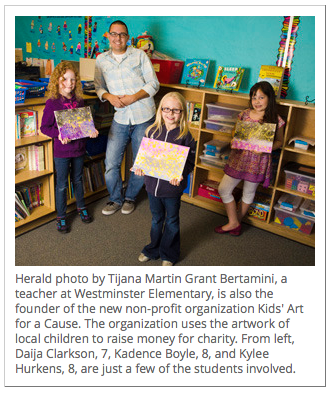 “We started painting because some people don’t have beds,” said student Kadence Boyle, 8. The paintings have been up for sale on the website http://www.kidsartforacause.ca, with 14 having been sold as of Monday afternoon and seven still available. Bertamini said the idea behind starting Kids’ Art for a Cause was to employ a streamlined process for donating money to charity. He incorporated the organization, earned the non-profit status and got a sponsor to cover all of the overhead costs, ensuring that all donations go directly to the charity. Kids’ Art for a Cause is also planning to develop other fundraising projects with groups of kids in other schools, as well as youth groups, beginning next year. “One of the points of this is that we raise money for charity. But that’s almost secondary,” Bertamini said. As posted on Newmarket Era, October 9, 2014. 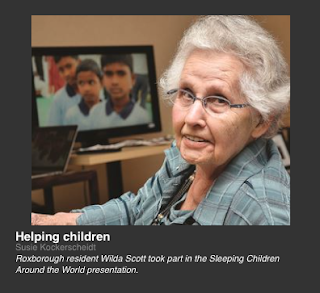 Many children across the world can sleep a little safer, thanks to residents at a Newmarket retirement complex. The Roxborough Retirement Residence collected about $900 for Sleeping Children Around the World, a Canadian charity that provides bed kits to kids living in 33 countries, during a fundraiser that included a presentation by Sandra Riches, whose parent lives in the facility. Riches, who volunteered to hand out kits for the charity in India last year, said Sleeping Children makes a difference in the lives of families in developing countries. Seeing the effects of the initiative firsthand prompted Riches to relay the importance of the charity’s work. Each bed kit consists of a mat or mattress, pillow, sheet, blanket, mosquito net (if applicable), clothes and school supplies. Kits cost $35 each. Since its founding by Murray and Margaret Dryden in 1970, Sleeping Children has raised more than $23 million, according to the charity’s website. The organization has helped more than a million kids.